As home prices continue to climb to all-time highs in coastal hotspots such as New York, San Francisco and Los Angeles, homebuyers have been setting their sights on more affordable markets primarily located in the South and Midwest. But, SmartAsset’s study released on Tuesday shows that homebuyers are starting to be priced out of historically affordable markets such as Dallas, Nashville and St. Louis, thanks to inadequate income growth. Across the 56 U.S. cities with a median home value to median household income ratio above 4:1, the median home price is on the rise in 43 of them with North Las Vegas leading the way. In 2016, the median home value in North Las Vegas was $192,600 — 3.44 times the average household’s annual income ($56,000). Fast forward to 2017, the median home value to annual income ratio increased 17.47 percent to 4.04, meaning that income growth failed to match home value growth that year. 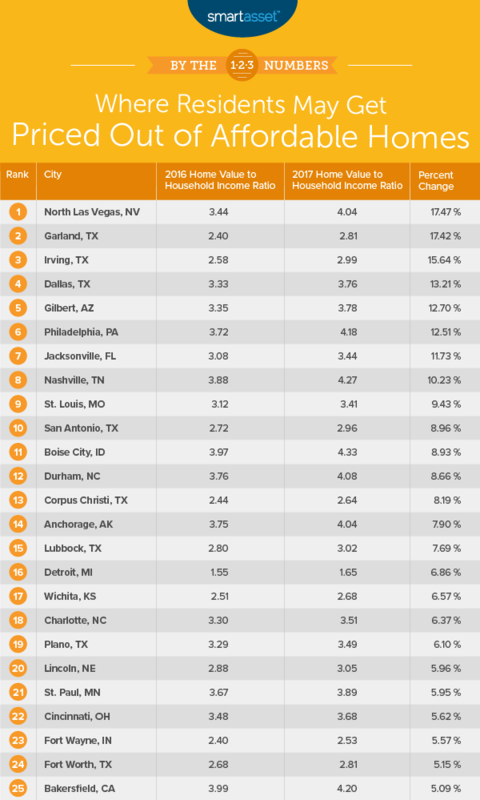 Although Sin City nabbed the top spot, Texas dominated the list with Garland, Irving, Dallas and San Antonio experiencing home value to annual income ratio growth as high as 17.42 percent and annual home value growth as much as 20 percent. In 2016, the median home value in Garland was $136,700, meaning the average home was worth 2.4 times the average household’s annual income ($57,100). By 2017, the average home in Garland was worth 2.8 times the average household’s income — a 17.4 percent increase year-over-year. Irving (2.6 to 3.0), Dallas (3.3 to 3.7) and San Antonio (2.7 to 2.9) experienced similar jumps in median home value to median household income ratios from 2016 to 2017, and those ratios are expected to grow as income growth remains lackluster, said the report. Other cities in the top 10 including Gilbert, Arizona; Philadelphia, Pennsylvania; Jacksonville, Florida; Nashville, Tennessee; and St. Louis, Missouri; are all facing similar fates as income growth has simply fails to match the pace of home value growth. Smart Asset VP of Financial Education AJ Smith says families in these markets can better bear the brunt of rising home prices by carefully considering all the costs associated with homeownership, such as property taxes, repairs and enlisting the help of a financial planner to help them be prepared. “For one, repairs to your abode will be made on your dime, which is not usually the case for renters. You will be also on the hook for property taxes, which can be significant, depending on where you live,” Smith said. To rank the cities, SmartAsset first found a list of cities that we considered affordable. To do this, they took the list of the largest 100 cities and filtered out any city that had a 2016 median home value to median household income ratio above 4:1. This left SmartAsset with 56 cities. They then ranked the cities according to the percent change in home value to household income ratios. The city with the largest percent gain ranked first, while the one with the largest percent drop ranked last.